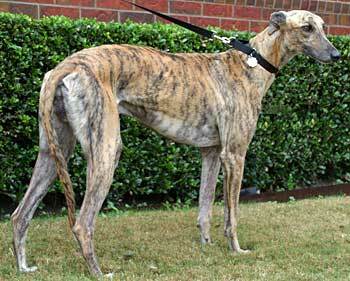 DJ, aka Deb Joe, is a strikingly handsome almost 4 year-old brindle male, born March 21, 2004. 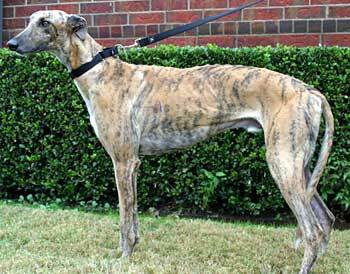 His sire is Fuzzy's Geronimo, making his grand sire Wigwam Wag, and his dam is Gabriela. DJ was found as a stray south of Waco by a kind man who took him in and tended to his many open wounds. 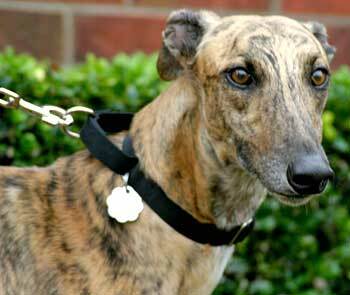 GALT was contacted, and DJ arrived into our family on December 10, 2007. His 4 race career was all run at the Corpus Christi track, starting December 15, 2005, and ending January 16, 2006. His whereabouts since his last race, and his being found almost one year later are unknown at this time. DJ has been successfully treated for several tick diseases, and is now ready to find his forever home! DJ is not cat tolerant, and it is not known if he is small animal tolerant at this time. We have had DJ in our home for a short time, but we have been rewarded with an outpouring of love and affection from him, as if the joy of seeing these greyt dogs evolve is not enough. He is so thankful to be in a home that he eats very slowly, as if not to make a mess or maybe because he wishes to savor every morsel that is given to him. He does not rush the door to try and get out either. He prefers to sleep in his crate at night with the door closed; during the day he sometimes goes in for naps with the door open. DJ does not surf the counters, but he does like to be in the kitchen where his people are. You will always know where he is, right with you! He enjoys his floppy toys and squeaky ones. A ten-year-old boy was one of his biggest pleasures. They played "ring around the dining room table" until they were both so tired that they had to rest together on his bed. Ask to see the picture. He has gained confidence from his buddy foster sister. His walks at night and the temptation to catch rabbits is an ongoing lesson. Morning walks are much better. DJ has had only one accident in the house and that was on day two. I believed him when he said he didn't have to go. The only time he has gotten on the furniture was when he was following his sister and she thought he wouldn't. DJ is looking for his forever home and will reward you with so much love.